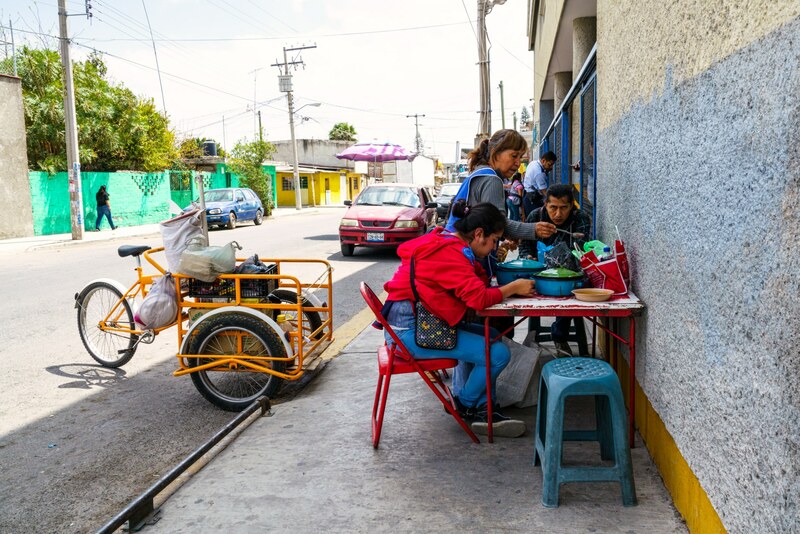 Between December 2017 and March 2018, I had the opportunity to work on some photo projects in Mexico. I present a series of three articles about my work on the sweatshops of the Tehuacán region in the state of Puebla. 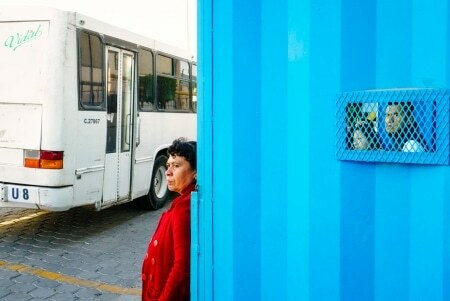 This series of articles is a small window of the underside of the garment industries in Mexico. In 2018, it is not possible to have an interest in Mexico and disregard the exceptional context of violence in the country. For my first stay, I originally intended to document the presence of Canadian mines in the state of Guerrero and the violence related to them. In January 2018, a union leader was assassinated in connection with the workers strike in a Canadian mine, Torex Gold. He was the third worker in this mine to be killed. But I was strongly advised not to go to this state. Numerous road blocks improvised by traffickers are frequently erected. Kidnappings are commonplace. It is in this state that the 43 Mexican students, made the headlines with their disappearance. 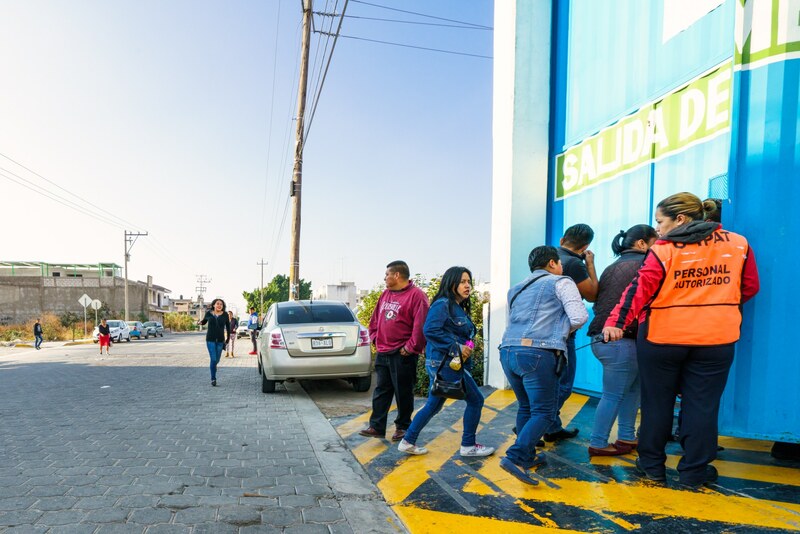 During my first stay, I had the opportunity to meet with human rights defenders from the Tehuacán region who participated in various campaigns to help local factory workers. When we think of sweatshops, we think more often of Southeast Asia than in Mexico. Yet Mexico is one of the major suppliers of consumer goods. In particular, Mexico provides a significant amount of clothing available in western markets, particularly in the United States and Canada. Mexico is one of the most violent countries in the world. in 2017, it was the country that saw the most journalists assassinated before Syria and Iraq. It’s also 37 000 missing persons and 29168 murders in 2017. A dog is exercising in front of the jeans factory. In garment factories, the wage is about 1.5 to 3 times the minimum wage. By the way, this is the way to speak in Mexico, it is not said: “I earn x or Y of the hour, the day or the month”. They say: “I earn X or Y times the minimum wage”. In most factories, you are on a limited contract. The contract may be more or less long. Often it is as short as only a few weeks. This means that you do not know what to expect from one week to the next. You are not unionized and if you are, it is with a Charo union, a union of convenience. 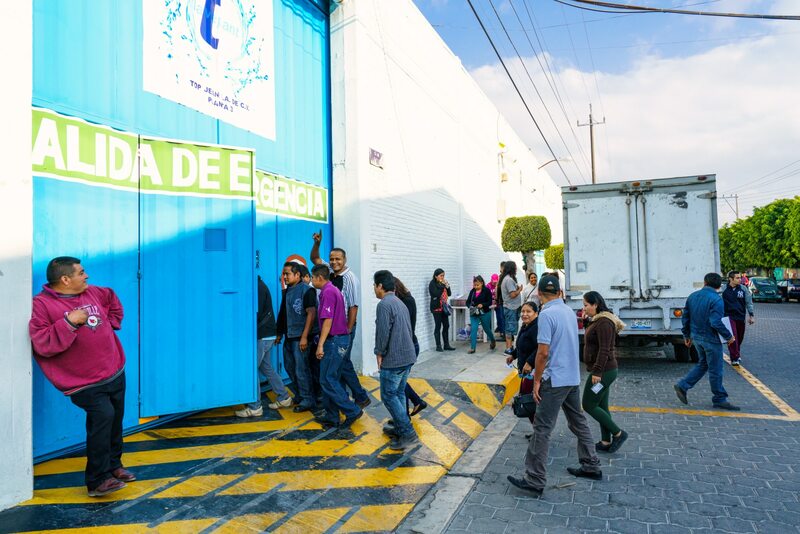 The issue of Mexican labor is a huge issue and cannot be addressed here with details, but you can check out this article to learn more about the topic. But let’s just give this example to give you an overview of the state of the situation. When a company opens its doors, it can itself set up a union. The employer can assign a representative. This “trade union entity” must then be approved by the Ministry of Labor, which is almost always the case. The new Mexican president, Andres Manuel Lopez Obrador has promised a reform of the Labor Code and fight corruption that is endemic. During my stay in the Tehuacan region, I was accompanied by Martin, a local human rights defender, who knew the terrain very well. For our first day, he took us to the town of Ajalpan. 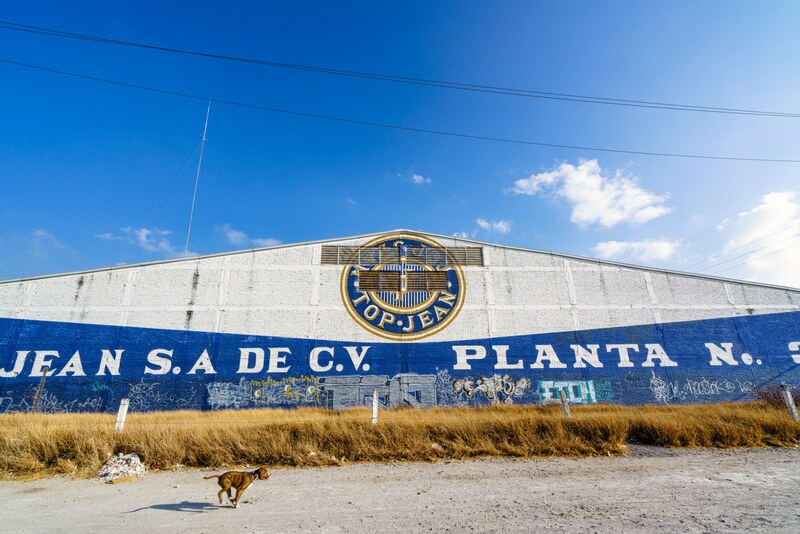 Located 20 km from Tehuacán, the municipality of Ajalpan hosts a large proportion of garment industries. We were traveling in the car. We were looking around to see if there were any interesting places to take pictures. This city is now famous for a particularly sordid incident. A scary story. A story that gives another color to fake news. I make the connection because at the heart of lynching, there is a false rumor. A rumor that then spreads like a wildfire on what’s app and on Facebook. Two young people from Mexico City are doing door-to-door surveys. A rumor is spreading. They would be kidnappers of children. 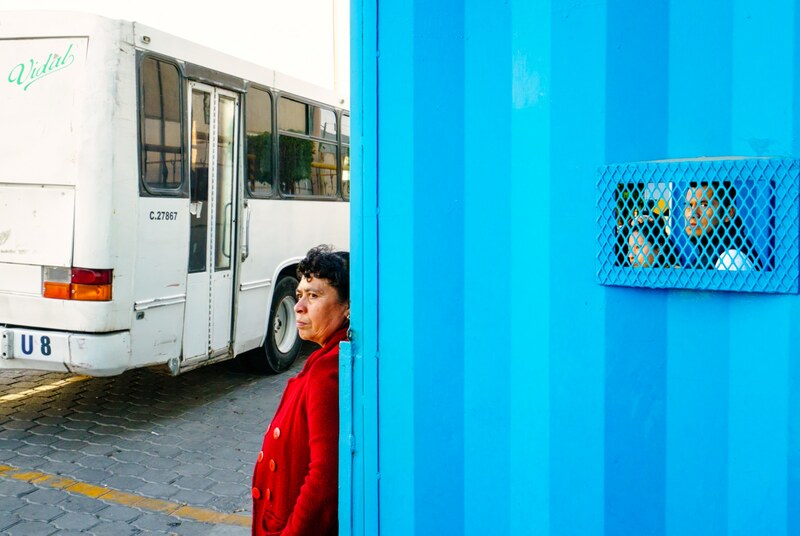 In Mexico, 6600 children have been missing since 2006. Local police are informed of this rumor and arrested them for interrogation. The police quickly realized that the story had no basis, but in the meantime masses of people gathered in front of the police station. The crowd stormed the station and seized the two young men to drag them into the street where they beat them and then burn them and turn them into a human torch. The two young men lost their lives in the hands of this angry mob. 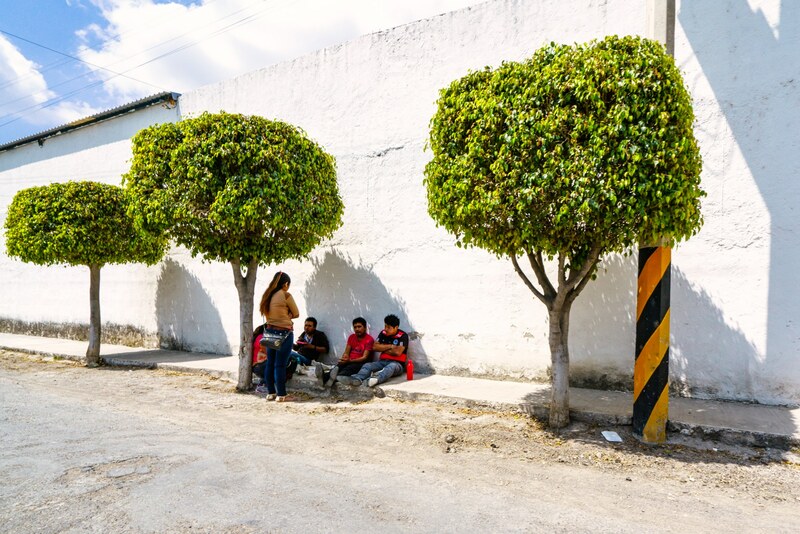 Since then, several strangely similar lynchings have taken place in Mexico, such as Santa Ana Ahuehuepan and San Vicente Boqueron. 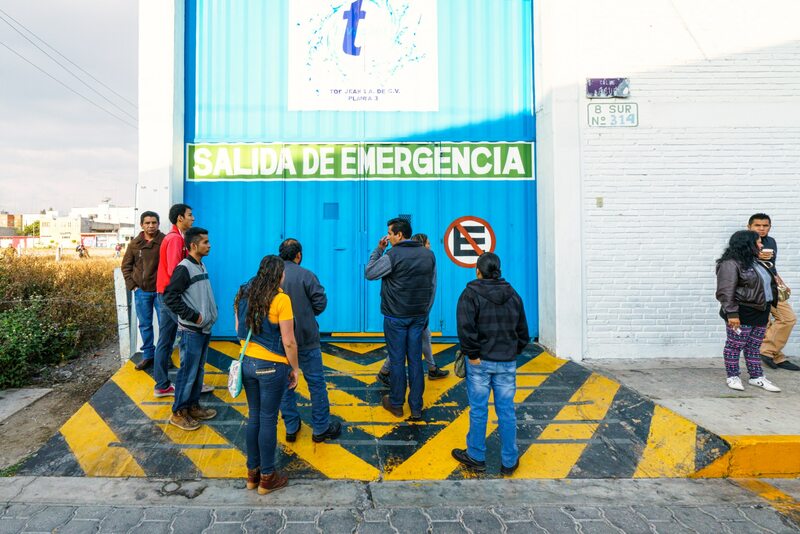 In all, just in the state of Puebla, 16 lynchings took place in 2018. I tell this story because it was a backdrop of my short trip to this part of Mexico. Taking pictures of the abuses suffered by workers in Mexico can lead you quickly to jail or worse. Martin has gotten us out of potential problems with security guards and the police several times. Martin told us the story of the lynching in the car on the way back. He explained to us that it had escaped him. He had not thought about it until he came and remembered that he had begun to feel uncomfortable. This town had always left him a little worried about it. That’s when we drove past this jeans factory. We stopped to take some pictures on the pretext that we were admirers of the brand whose name we forgot as fast as it was pronounced. 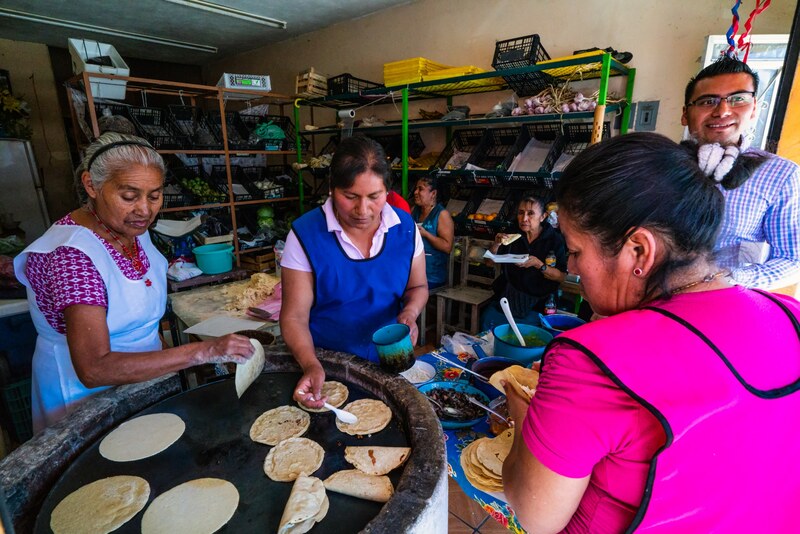 The Tehuacan region of Mexico has long been referred to as the "jeans capital". 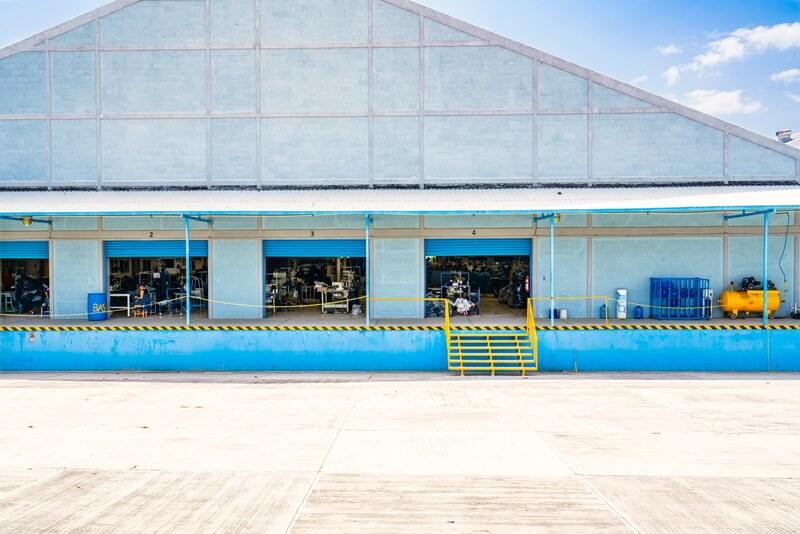 It still concentrates today a large number of clothing factories like this imposing installation of the city of Ajalpan. 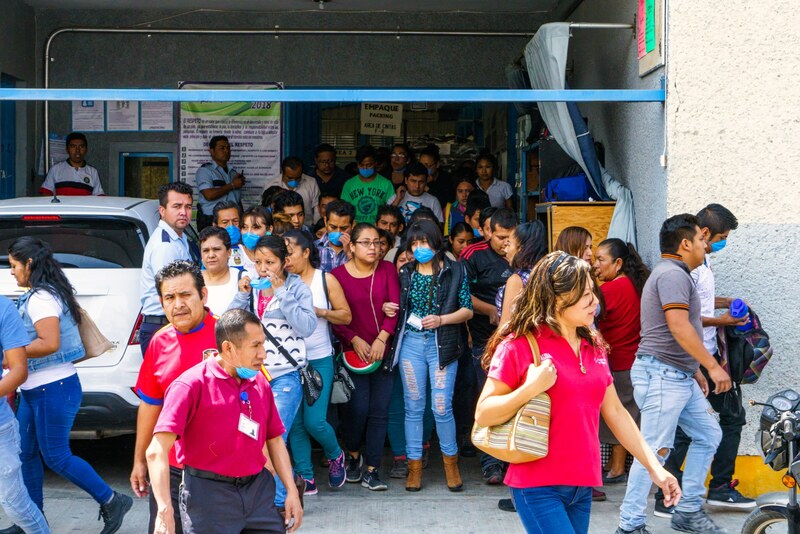 Ajalpan made international headlines in 2016 for the lynching of two pollsters in the city of Mexico together, on the basis of a false rumor that they were kidnapping children. 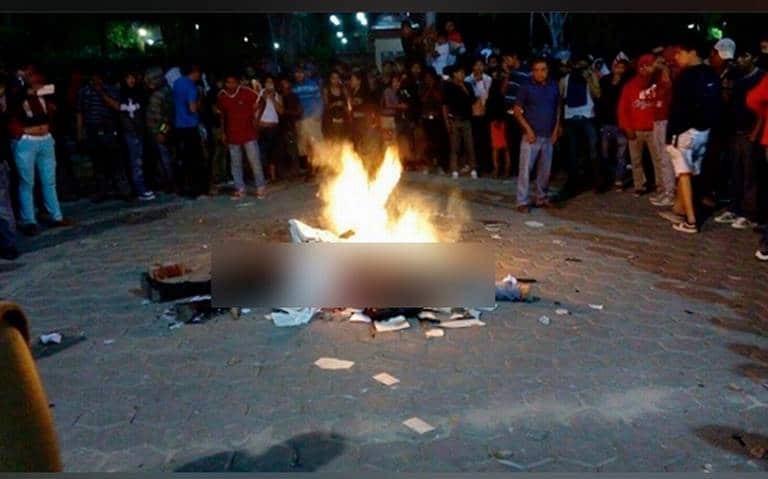 Both men were savagely beaten and burned alive by the locals in the central square of the city. Mexico is now like that outside of the big hotel complexes. It’s a powder keg. It’s a hard life. It’s the corruption of the justice system and the police that are supposed to ensure your safety. It is exploitation at work. It’s the pressure cooker that always lets out a little bit of steam and sometimes explodes. It’s the total blockage. 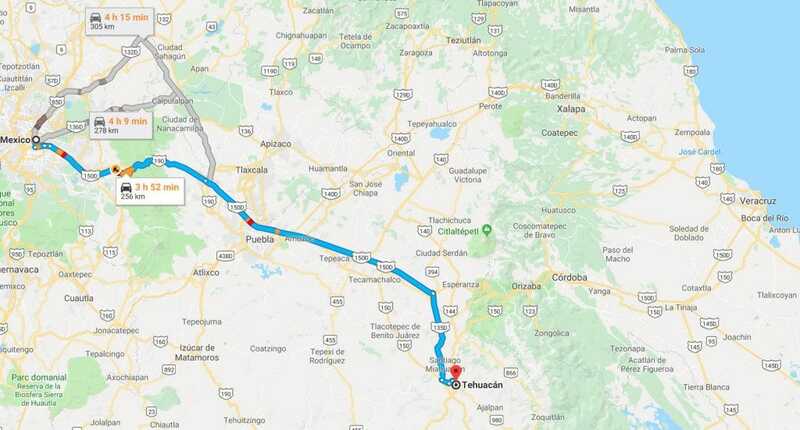 Tehuacán is a city that has more than 300 000 inhabitants and is located just over a 3:30 drive from Mexico City. The Tehuacán Valley is considered to be the birthplace of corn. Since the firstNAFTA version in 1994, the region has undergone significant changes. 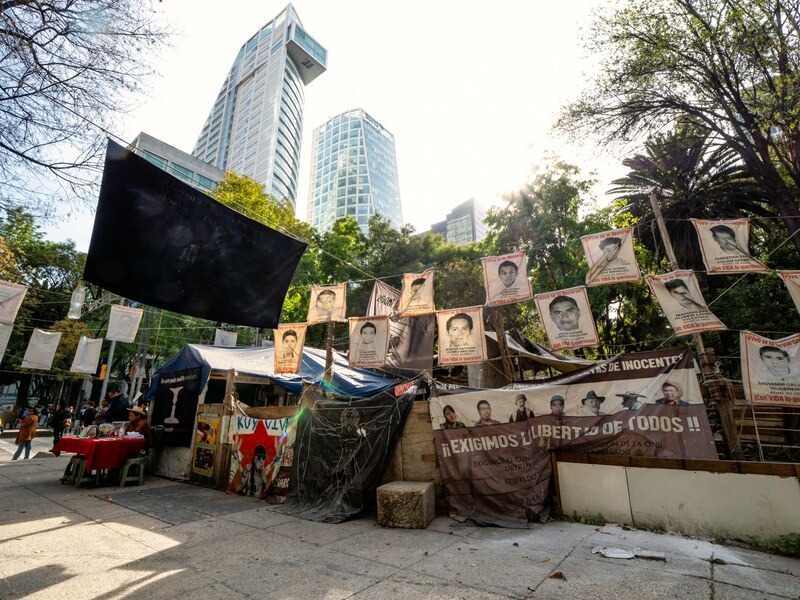 Agrarian reforms have shaken the few remaining legacies of the Mexican Revolution. Large chicken farming complexes were born. From the air, warehouses similar to the chicken enclosures of the territories adjacent to the city are also found in the heart of the city. 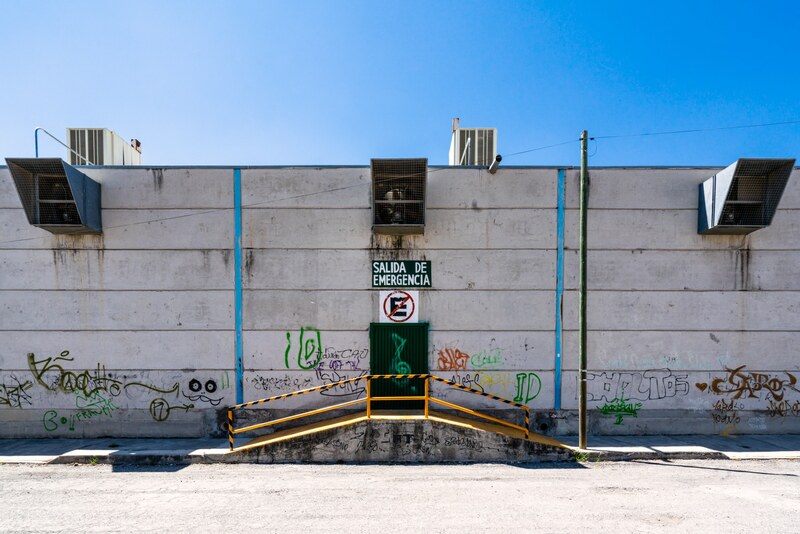 With a strangely similar architecture, the large garment workshops occupy an important place in the urban landscape of Tehuacán. 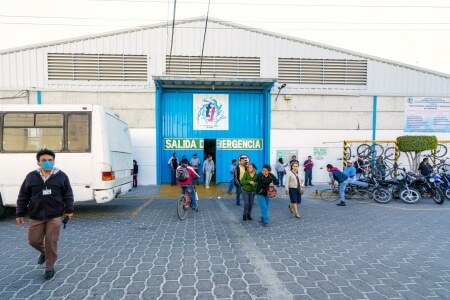 Every morning, tens of thousands of women and men cross the threshold of these factories to make clothes, mainly jeans. The region is recognized as the “capital of Jeans”. 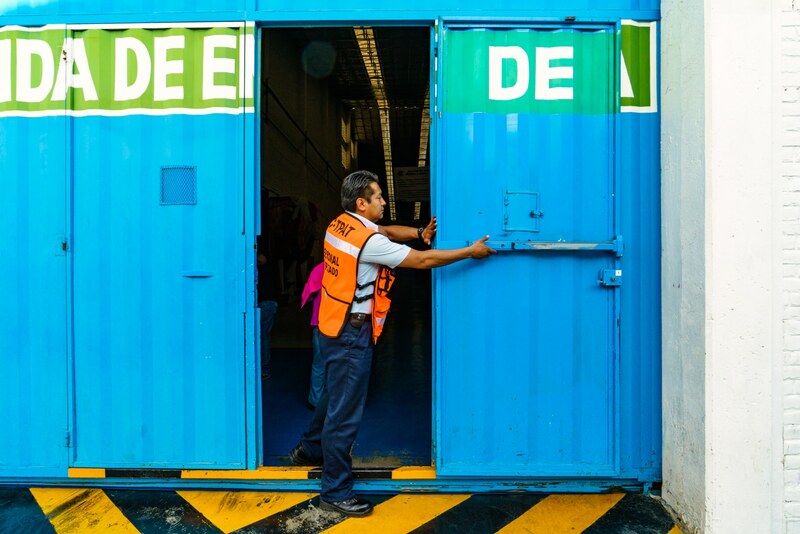 Workers do not come just from Tehuacán; They can come from as far as Veracruz which is more than three hours away. Some sleep in Tehuacán, others go back and forth. Every morning, six days a week for the most part, it’s the same routine. Between eight and nine o’clock, it’s the race to be on time. If you are late, you are penalized on your salary or the door is closed and you are not paid at all. Every morning, the security guards greet you. It is not surprising that we learn that the life of the garment workers is hard, very hard. The pressure for production is strong. Breaks are rare or non-existent. Workers even report that they are forced to wear diapers because they are not allowed to go to the toilet. Constant exposure to tissue dust creates lung problems. The hands are stained with dye. 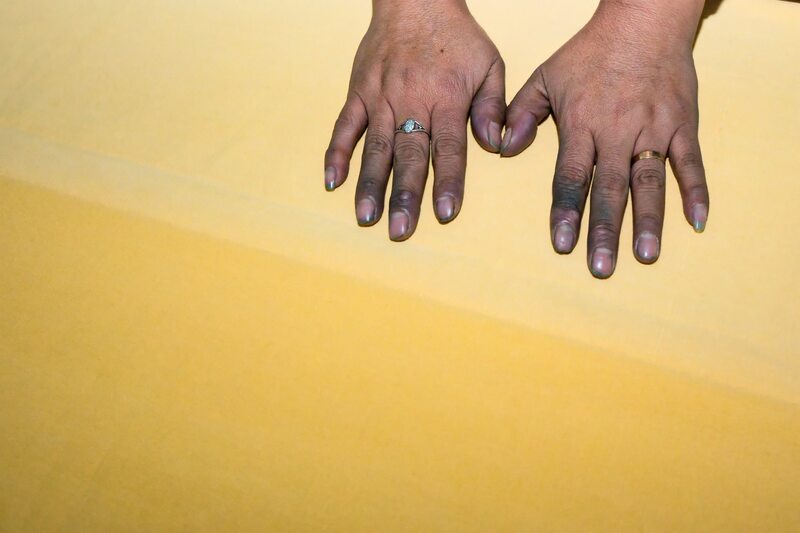 A female garment worker shows her hands stained with dye. Sexual abuse is not really documented, but is reported as constant. Sordid stories like blackmail for sexual favors in exchange for keeping a job. The long hours of work and the six-day work week also cause considerable problems in work-family conciliation. Precariousness is the norm. Life is lived from paycheck to paycheck. 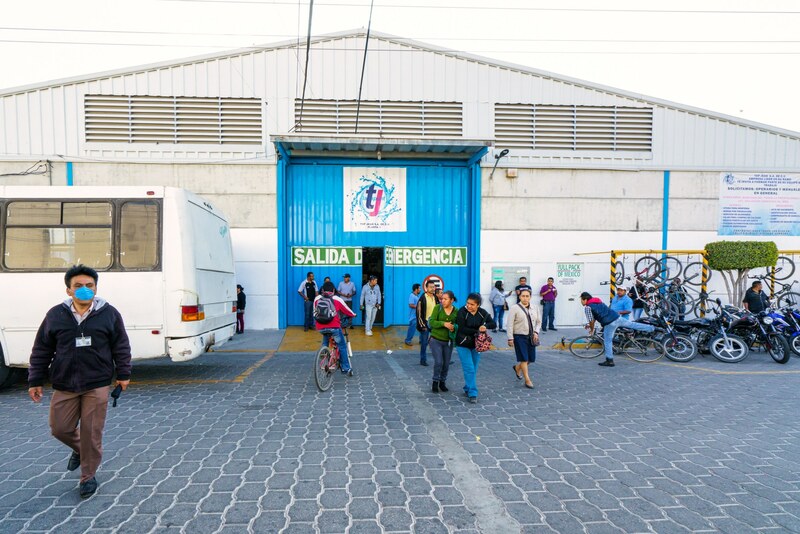 I am currently working on two other articles about Tehuacán’s garment factories. The second will be about transformations in the modes of production modifying the modalities and places of work. The third will be about the environmental impacts of the garment industries. You can see the album of the Workers entrance to the factory here. You can see the complete albums about the workshops and my other projects, click here.